Vinexpo is the world’s largest wine trade fair. It is being increasingly challenged by Prowein in Düsseldorf, but is still number one. To “do” Vinexpo takes at least two full days – which is what I took, even if I came away feeling as though I had only scratched the surface. The first day I attended, Sunday the 14th of June 2015, was also the first day of the show. I had a few meetings, but was mostly free as a bird. 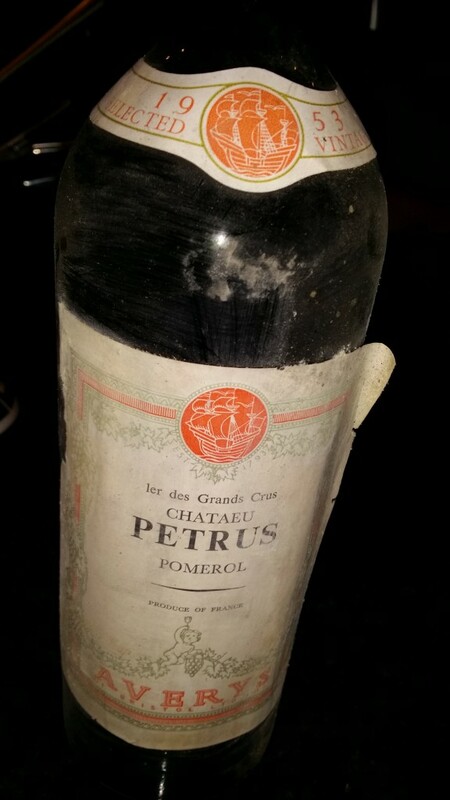 My friend Izak Litwar – http://www.greatbordeauxwines.com/ – asked me if I wanted to come along with him to the Philippe de Rothschild stand. 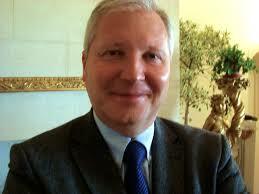 He had an appointment with Philippe Dhalluin, Technical Director in charge of managing all the Ph. de Rothschild estates. How could I say no? I was all the more tempted since I had not met Monsieur Dhalluin before and also because I rarely make it to Mouton during en primeur week to taste their wines. There was a bit of emotion when I first arrived at first at the Rothschild stand because François Hollande came to visit briefly, along with a horde of journalists, flunkies, well-wishers, and bodyguards. One of the latter pushed a poor photographer hard up against a wall as though he were a terrorist, which seemed pretty shocking to me. Anyway, Philippe Dhalluin is a tremendously charming man. Not the unctuous, overly cool and sophisticated type of charm, but one full of bonhomie, natural optimism, and genuine interest in others. 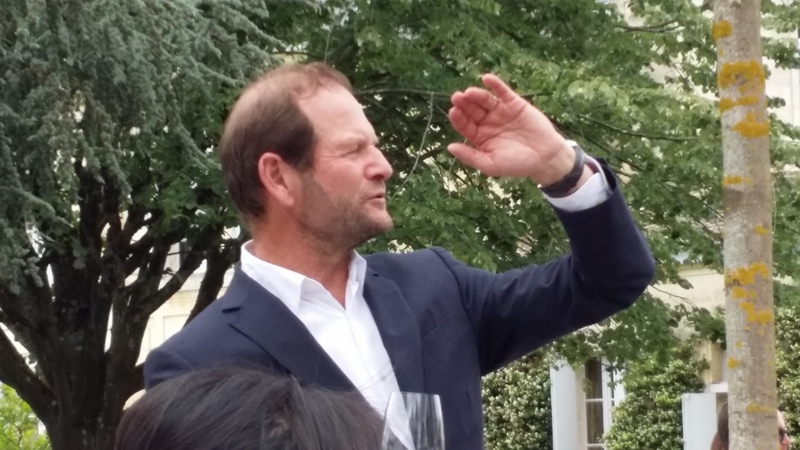 We were delighted to taste through the Rothschild great growths from the 2014 vintage with him. 2014 D’Armailhac had a sweet lovely nose with both the blackcurrant and lead aromas I associate with Pauillac. The wine was tense and exuberant on the palate with good acidity and some minerality on the aftertaste, which had good length. 2014 Clerc Milon was even more obviously Pauillac, with a very clean and enticing bouquet. It showed more acidity on the palate, along with good textured tannin. 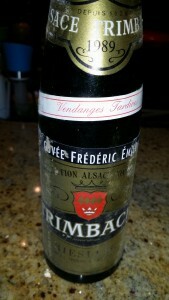 Not a big wine, it also seemed a little more commercial in style and possibly a touch dilute. 2014 Petit Mouton had a deeper color than the two previous wines. The nose seemed a little off (reduced), but I think that is only because this is not an ideal time to taste the wine. 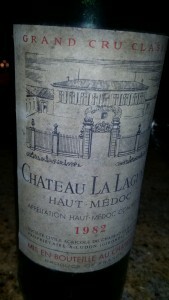 It was much more attractive on the palate, which proved to be richer and bigger than the 2 fifth growths. It also had good grip. I’m sure this will turn out to be a fine second wine. 2014 Aile d’Argent had some lime and lanoline overtones on the nose. There was an impression of sweetness on the palate of this dry wine which had trouble rising above the good-to-possibly-very-good level. As rare as it is, and although it comes from Mouton, I must be honest and say that it is nothing very special in my opinion, i.e. not a champion price/quality ratio. Monsieur Dhalluin was glad to answer a few questions. I started with something pretty basic. How would he describe in a few words the difference between d’Armailhac and Clerc Milon. He said that the characteristics are primarily due to terroir. Simply put, d’Armailhac borders on Mouton Rothschild, north-east of Pontet Canet, and has qualities more in keeping with that part of Pauillac. The soil has more gravel and the estate is much bigger than Clerc Milon (40 vs. 80 hectares). Clerc Milon is on the Plateau de Musset opposite Lafite. It is therefore more delicate and similar in style to that wine. Monsieur Dhalluin surprised Izak and myself by asking if we would like to stay for lunch. We accepted with pleasure. 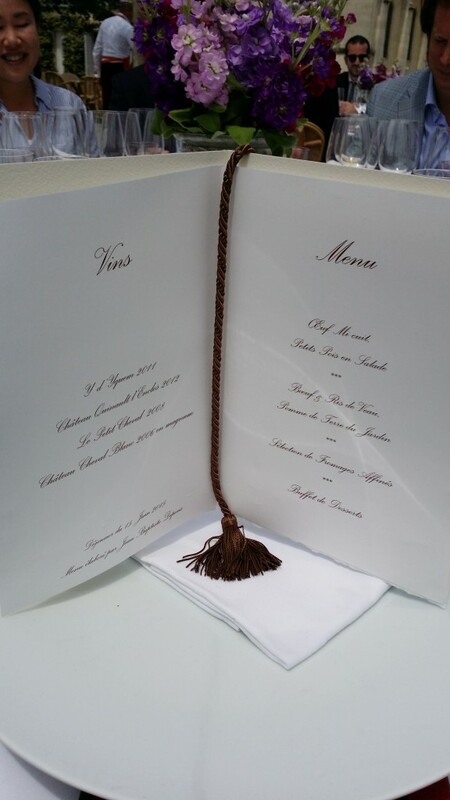 I’ve included a photo of the menu. 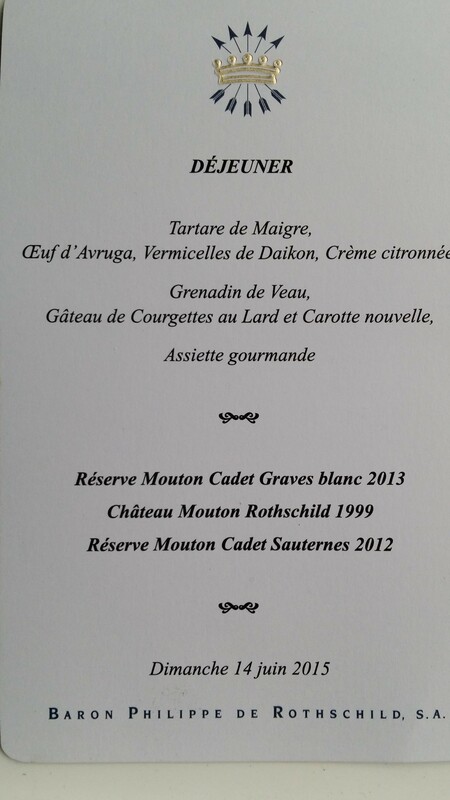 I was very surprised by the 99 Mouton. Not that it was poor by any means, but by the fact that it was so far along. If tasted blind, I would have put it much older. I have a bottle in the cellar and must open it soon. On Tuesday, I was invited to lunch at Ch. Cheval Blanc along with my friend Richard Bampfield MW. Seeing as I don’t take notes at table, I apologize for the lack of details about the wines. 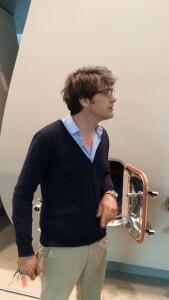 Prior to the meal, we visited the new cellars with winemaker Pierre-Olivier Clouet. The French just love to use – and often misuse – the word “passion”, but I must admit that this is the best word to describe Pierre-Olivier’s approach to Cheval Blanc. He is young, enthusiastic, well-travelled and, obviously, very capable. He is also a great communicator, which doesn’t necessarily follow with people who make fine wines. I just loved his description of when to pick the grapes at Cheval Blanc: al dente! 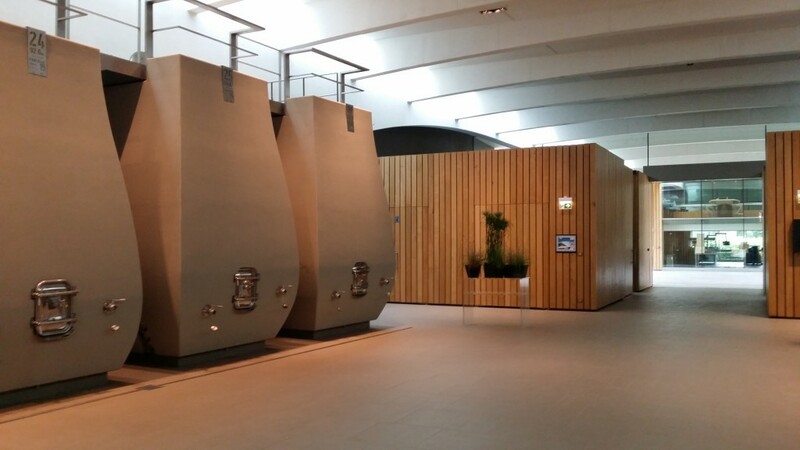 The vat room is extremely modern and tasteful, and there’s a green roof on top. Many people knock second wines, but I found the 2008 Petit Cheval very full-bodied and sensual. The 2006 Cheval Blanc (from magnum) was nowhere near as open as many wines from that vintage. Neither was it hermetic though, and it was certainly a treat. I sat with Pierre-Olivier at lunch and asked him about Ch. La Tour du Pin. As you may recall, for years there were two Saint Emilion grands crus classés with the same name: La Tour du Pin Figeac. One belonged (and still does) to the Giraud-Belivier family and the other to Antoine Moueix. When Bernard Arnault and Albert Frère bought the latter, they renamed it in simply La Tour du Pin in order to avoid the inevitable confusion. However, I told Pierre-Olivier that I had stopped seeing the wine around and wondered what had become of it. He explained that, after years of experimenting and tasting, they were convinced that 1.8 hectares of the 8 hectares were good enough to go into Cheval Blanc. Of course, this is perfectly legal in Bordeaux, as opposed to Burgundy. So, I asked him the inevitable question. What about the other 6.2 hectares? You could have knocked me over with a feather when he told me that they had planted white wine grapes there! In fact, they’ve been making the white wine for several years now, but are not ready to release it and don’t as yet know what it will be called. The reason for this is simple: Cheval Blanc feels that the soil is better suited to a fine white wine than a fine red wine. Posted in Uncategorized on July 7, 2015 by AlexR.